. Yama no Kami 山の神 Yamanokami - Introduction .
. Ta no Kami 田の神 Tanokami - Introduction .
. Legends about Yamanokami 山の神と伝説　. Yamanokami and 飛騨の工 a master carpenter from Hida made a competition. The carpenter said he could built three houses until next morning. Yamanokami weaved a cloth and tried to cover the whole mountain area. Next morning the three houses were almost finished when suddenly the whole mountain was covered in white snow - so Yamanokami had won.
. “Hida no Takumi” 飛騨の匠 Master Builder, carpenter from Hida, Gifu . Therefore wood cutters plant a fresh branch by the side of a stump from a tree they have just cut down. Every night Yamanokami comes to count the trees and if there is no branch, she will know the tree has been cut and punish the wood cutter. The main mountain forest had all been cut down, so Yamanokami went off to 三瓶山 Mount Sanbesan (1,126 m). If a cow has gotten lost in the mountain, people make an offering of Okoze, which Yamanokami likes, and then the animal will be found soon.
. okoze 虎魚 / 鰧魚 / オコゼ / ヲコゼ stonefish and Yamanokami . If a fishing boat gets lost in the wild waters of the Nihonkai sea, there might be a light on the top of the mountain. Fishermen use this light to come back home safely. Therefore the local fishermen often go to the top of the mountain to pray to Yamanokami. Along the Shiga river there is a huge pine tree. Once a wood cutter was trying to cut id down, but when he looked up, he saw a sugegasa 菅笠 sedge hat hanging up there. When he looked closer, he suddenly felt very ill and could not cut the tree.
. sugegasa 菅笠と伝説 Legends about the sedge hat . Yamabiko Echo is the voice of things given to them by Yamanokami. and the forest on the other side responded with the same sound. The hunter was surprized and called out "Whow!" and the answer "WHOW" came back soon. The hunter became afraid and run for home as fast as he could.
. Yamabiko 山彦 / やまびこ "Echo".
. Yamanba, Yamauba 山姥 / 山ン婆 mountain hag monster . On the 9th day of the second lunar month, Yamanba is cooking rice. On this day people are not allowed to go the the mountain or cut trees. Yamanba is another name for Yamanokami, others say it is the wife of a Tengu.
. Yamanokami and 天狗 Tengu legends . Kanayago is 炭焼きの神・火の神・鉄山の神 the female deity venerated by charcoal makers, protecting from fire and in mines. She is venerate dway back in the valley of Ibaradani 井原谷. The deity tends to curse people who do not keep the rituals, pee in her direction or cut off branches from sacred trees. Once she cursed the family of 山口恭一家 Yamaguchi Kyoichi.
. Kanayagogami 金屋子神 / カナヤゴガミ Deity of the Blacksmith .
. Aragami 荒神と伝説 Legends about the Aragami deity . 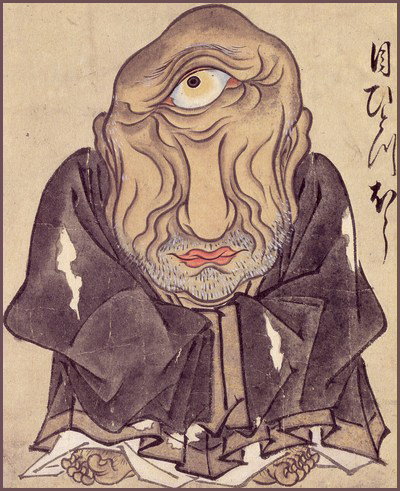 - Koojinsama, Koojin sama 荒神様 Kojin sama, "rough god", "wild deity"
If someone feels his eyes going bad or his body in bad condition for some days, they say it is the negative feeling of 水神さん the Deity of Water or 山の神さん the Deity of the Mountain. Yamanokami is venerated at special trees in the mountain forest. On the 9th day of the 10th lunar month, the festival day of Yamanokami, if people go to the forest they will get injured. A man who cut down a tree sacred to Yamanokami got ill and could not get up for more than 10 years, then he finally dies. His wife and his cows also died. The path where Yamanokami passes. If someone cuts a tree along this path, he will get a great injury. The saotome 早乙女 female planters of the rice fields of 大石家 the Oishi family wre one more as there are. That was rather strange. When they brought the lunch trays there was one less then counted before and one tray was too much. They said that Yamanokami from the mountain behind the home had come to help. A curious servant once followed the one female helper, but lost sight of her half way up the mountain.
. Yamanokami kofun 山の神古墳 Yamanokami tumulus in Japan .
. Hitotsume Kozoo 一つ目小僧 Hitotsume Kozo - Young Monk with One Eye . .
Mehitotsu Kozo is seen as Yamanokami, a Tengu. On the day of great cold and small cold, the young monk comes from the mountain." On the 8th day of the second and 12th lunar month, people put a baskets of woven bamboo (mekago 目籠)) on a pole. This will prevent Mehitostu Kozo from coming.
. koto hajime 事始 beginning of work and activities . Starting of February 8. Work stopped on December 8. Both days with an 8 are called "Days of Work (things)" (koto no hi 事の日). .....koto no yooka 事八日（ことようか）"day number 8"
- - - - - Shizuoka . Yamanba, Yamauba 山姥 / 山ン婆 mountain hag monster . Wehn Yamanba started to build Mount Fujisan, she carried earth from Mount Kurakiyama. On her way at night she heard the sound of someone grinding a mortar and went there. leaving the earth. This became 浅間山 Mount Asamasan. 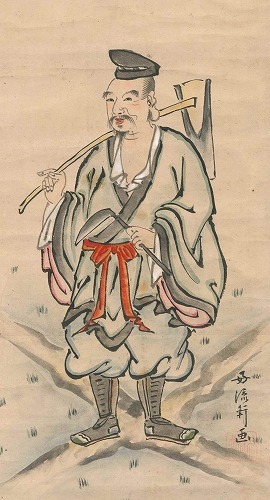 龍筑坊 Ryuchikubo，白髯童子 Shirahige doji and 常光坊 Jokobo. They became the lords of the areas 龍頭嶺 / 竜頭峰 Ryutozan, 神三沢（三つ森 Mitsumori）and 山住奥の院 Yamazumi Oku no In (in that order). The Yamanba later took off and lived at 浅間山 Mount Asamasan in 佐久間 Sakuma. Her living quarters were the home of 杉本家 the Sugimoto family. The name of their estate was カリヤド Kariyado. In the mountain in the back of the estate was a sanctuary for Yamanokami, where Yamanba had planted wisteria. Yamanba often helped pregnant women during birth and showed them how to weave. But one day she ate the baby of the family and had to hide in a cave at Mount Kurakiyama. It was dark (kurai) there and that changed to the name of the mountain, Kuraki. Much later the Samurai 平賀中務 Hiraga Nakatsukasa and 矢部後藤左衛門 Yabe Goto Izaemon came and chased her away. Now she had to fly to 秋葉山 Mount Akibasan. If someone goes to the mountain on the day of the festival for Yamanokami, he will be blown away by kamikaze 神風 a divine storm. Some farmers burning the fields in spring near a place where Yamanokami is venerated have been cursed. To get rid of the curse they had to perform special purification rituals. The area is now ケチ地 off limits.
. keyaki欅 Zelkova and fuji 藤 wisteria tree . If someone cuts the sacred tree at 田沢 Tazawa or burns its leaves, he will be cursed. Someone went to the forest on the day of the festival for Yamanokami, but he was hit by an arrow and lost his eyesight.
. shinboku 神木, shinju 神樹　sacred tree, divine tree . 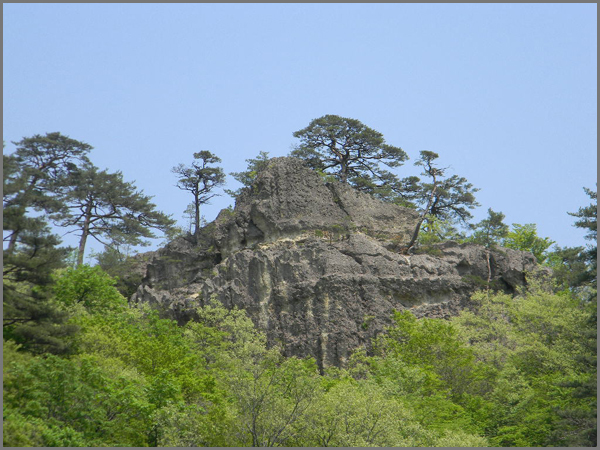 A mountain with a tree sacred to Yamanokami is called Hyora mountain.
. kashi no ki カシの木 / 樫 oak tree . This tree is sacred to Yamanokami. If someone tries to cut such an old tree, he will be cursed, die soon or get injured.
. Legends about trees .
. yama-inu, yamainu　山犬、豺 "mountain dog" - wolf legends . Both parents were preparing the fields and burning them in sprig. They took a break and made some tea but forgot to give some offerings to Yamanokami. That night they heard the eerie howling of a wolf and could not sleep at all.
. Yama no Kami 山の神 - Table of Contents - . sangaku shinkoo　山岳信仰 religion of the High Mountains is a different matter.
. Shrine, Shinto Shrine (jinja　神社) - Introduction .
. kami　神　Shinto deities - ABC-LIST - . On the second day of the 12th lunar month, the regional Yamanokami have a meeting and do the washing. They also count the mountains, so humans are not allowed to go there on this day. If people cook 味噌汁 miso soup on this day and smell of Miso while walking outside, they will get ill.
Yamanokami does not like the smell of Miso soup. Another legend about Yamanokami and Miso soup from Oita and from Yamagata.
. misojiru 味噌汁 Miso soup .
. Yamanokami and Tengu 天狗 the Mountain Goblin . Behind the Shrine 和田神社 Wada Jinja is a memorial of the deity 愛宕様 Atago sama, where Yamanokami is venerated. The pious son of a postmaster went there regularly to pray. On the 17th day of the 2nd lunar month the Tengu come there for a meeting. They are very large and their face is hardly to be seen up there.
. Chichibu no Tengu 秩父の天狗さま The Tengu from Chichibu .
. yama no kami no yasumigi 山の神の休み木 sacred trees of Yamanokami . When forest workers stay in the mountain hut they can hear the sound of boulders rolling around and trees being cut. This is Yamanokami showing his power. Another forest worker could suddenly not see any more on a clear full-moon night. Yamanokami had blinded his eyes to make him stop, they say. If someone goes into the mountain forest on the Day of Yamanokami, he will get injured. In the morning, one can hear Yamanokami making music with drums and flutes. Someone went to the river to put out his net for yamame ヤマメ salmon and got his net all full in no time. When he wanted to lift the full net out of the river, it was all empty. The fish he had caught before that were also gone from his basket. He had been fishing very close to a place sacred to Yamanokami. He became afraid, hurried home and had to stay in bed for many days.
. yamame やまめ (山女) masu salmon / Oncorhynchus masou .
. Sarugami 猿神 monkey deity . Since the monkey is Yamanokami, people are not allowed to do forest work on 申の日 the days of the monkey. If they do, they will have a lot of problems.
. oo-otoko, Ōotoko 大男と伝説 O-Otoko, Legends about giants . Since a giant with a red race came at night to shake the mountain hut, the forest workers held a ritual for Yamanokami during the whole night. Another carpenter had cut a tree sacred to Yamanokami and that night his home was shaking and kept him awake all night. But the other people sleeping in that house did not feel a thing. an archaeological site of the kiln at about 1,300 years ago.
. Yamanokami kofun 山の神古墳 Yamanokami tumulus . Yamanokami goes wild. Yamanokami rides the wind to go home to the mountain. A doctor from Otsu often went to 胆吹山 Tan-Ibukiyama (the old name of 伊吹山 Ibukiyama / Ibukisan in the Nihon Shoki records 日本書紀) to collect medicinal herbs and stones. But every evening some stones were thrown at him. Finally he realized that Yamanokami did not like the herbs and stones being taken away, so he brought them back to the mountian And indeed, all was quiet after this. Yamanokami is an old ugly woman, and she is very jealous. If anyone laughs about, she gets very angry and punishes that person. Yamanokami is a Tengu and lives in the trees. At the bottom of the mountain sacred to Yamanokami are statues of 道祖神 Dosojin, to pray for safety of the traveler.
. doosoojin 道祖神 Dosojin, wayside gods . If one goes to the mountain on the day of Yamanokami, he will get injured. A charcoal maker carrying his coal in a backpack was almost thrown down from the mountain path.
. Shinto Shrines (jinja　神社) - Introduction .
. kami　神　Shinto deities . A Shinto-derived new religious movement which began in 1935 when Tanaka Tomisaburō (1868-1967) rebuilt a dilapidated shrine in Okayama. After he had experienced a close brush with death on the frontline during the Russo-Japanese War, Tanaka felt he had received power from a talisman inscribed with four ideograms which he read sa-mu-ha-ra, and in turn he began to make miniature amulets (omamori) of this sort which he distributed for free. Because of such proselytizing activities, however, the regional authorities accused him of using an unauthorized shrine to conduct private business, and as punishment, the shrine he had constructed was stripped of its contents and burned to the ground in 1936. 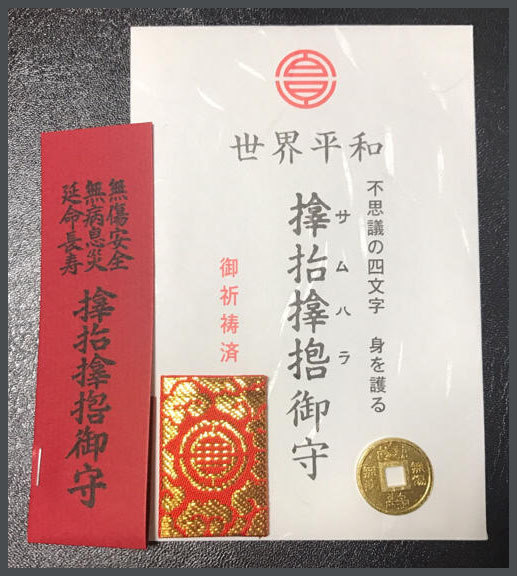 Tanaka, however, continued his activities of distributing amulets to troops being sent to the Asian front during World War II, and following the war in 1951, he registered his movement under the Religious Corporations Law (Shūkyō Hōjinhō) and rebuilt the shrine. In 1952 he moved the shrine to its present location. After Tanaka's death his adopted son Tanaka Kōichi succeeded him. The four letters SA MU HA RA help protect the body from harm and grand a long life. Since they are shinji 神字 characters of God, they can not be expressed with normal 漢字 Kanji characters and can not be reproduced on a computer.
. 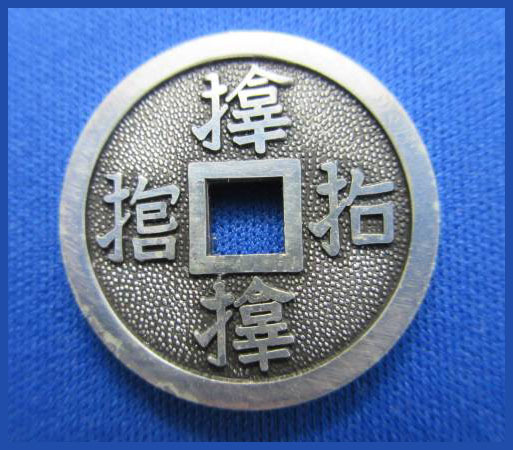 The Sword Guard 鍔 Tsuba . Once a tsuru 鶴 crane was caught, with the four letters SAMUHARA on its wings. People thought these letters would protect and bring a long life, so they copied them. 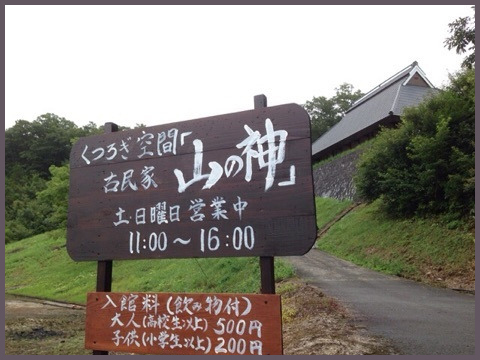 At 淡路 Awaji there was a temple with the ihai 位牌 Buddhist mortuary tablet of 斉藤実盛 Saito Sanemori. 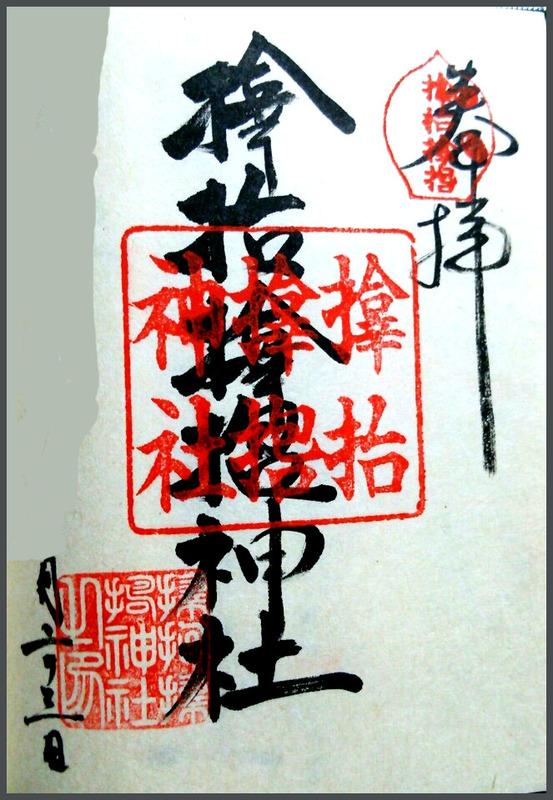 On its back side were the letters SAMUHARA.
. Saito Sanemori 斉藤実盛 (794 - 1185). . In 1668 a 鉄砲師 gun specialist from 紀州 Kishu named 吉川源五兵衛 came to Edo. At 大宮鷹場 the hawking area of Omiya in the village of 吉野村 Yoshino he shot 白い雉 a white pheasant. When he could get close, he saw on its back the leggers SAMUHARA. He thought this was an amulet to protect from injuries, so he wrote the letters on paper and shot at them. After that he never hit the target. A man in Edo had carried a SAMUHARA amulet on his body. When he fell from his horse one day, we was not hurt. Soon this kind of amulet became popular in Edo.
. Chiyoda ku 千代田区 Chiyoda ward . In 1652, the Shogun went hawk hunting. The hawk caught a large goose. The four letters of SAMUHARA were written on the breast of the bird. The canal at Kudansaka 件坂下 / 九段坂 is called 牛ヶ淵 "riverpool of the bull". It is a 魔所 bewitched place. Once in 1782, a Samurai rode here on his horse, but he fell down and tumbled into the "Riverpool of the Bull". But the man and his horse did not show any wounds. This is because once the Samurai was hunting for pheasants and shot at a kiji 雉 pheasant. He followed the bird and finally caught it and saw the four letters SAMUHARA written on its wings. Since then he had kept an amulet with these words in his breast pocket. In 1652, the Shogun went hawk hunting. The hawk caught a large goose. There were four letters written on the breast of the bird. The letters were SA MU HA RA.
. Iwate 岩手県 Tono .
. Japanese Legends - 伝説　民話　昔話 – ABC-List . 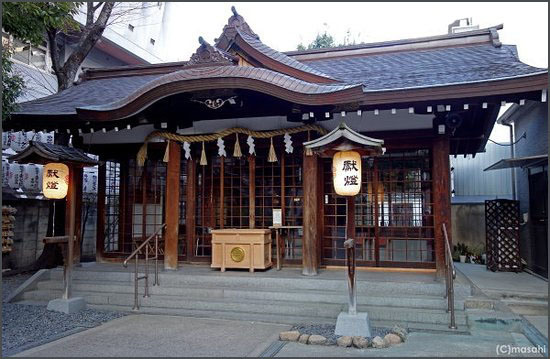 You see a sacred rope at the entrance to a holy place, usually a Shinto shrine, to mark the entry into a sacred area. They are also around sacred trees or rocks.
. shimenawa 注連縄 sacred rope - introduction .
. Join the Shimenawa friends on Facebook ! . In the family of 百合草光吉 Yurigusa Mitsuyoshi there is a special custom related to Yoshitomo. 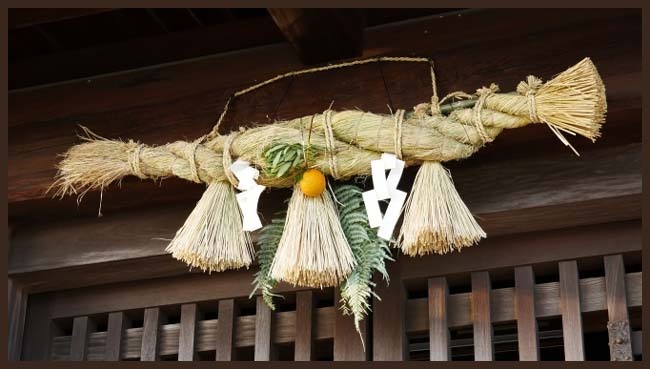 They place four reed gras stems in a square and put a Shimenawa around. In the middle they place 風呂 a bath tub. On that night they welcome Yoshitomo at the gate of the estate, putting out lanterns and waring ritual robes and small swords. The head of the family then takes a bath. When he is finished, they use 拍子木 wooden clappers to inform the other villagers to come over and have a bath too. This is their way of never forgetting what happened to Yoshitomo, and pass the knowledge on to further generations.
. Minamoto no Yoshitomo 源義朝 (1123 – 1160) .
. sagichoo 左義長 Sagicho, ritual bonfire . During these fire festivals around the 14 and 15 of January, the New Year decorations are burned, for example the sacred ropes.
. 天照大神 Amaterasu Omikami . On the 16th day of the first and seventh lunar month, the hunters have a special festival. They hang Shimenawa in the living room and place mochi 餅 rice cakes to honor Amaterasu Omikami. The hunters stay in the room for one day and night, offering prayers. The rice cakes are then taken to the mountains. They are said to prevent mountain slides in the coming six months. For the New Year a new Shimenawa is bound together from seven ropes. If the end shows down to the ground, the year will bring rain. If the end shows up to the sky, there will be fine weather. From the beginning of the rope, there are twelve months to be counted, each one with the aim to divine the weather of this month. People who are bad of hearing go to the old Katsura tree near the bridge. They bring an old bowl (o-wan), open a hole in it and put 麻糸 a hemp thread through it. This custom is called o-wan hagoki. Instead of a hemp thread they may use a Shimenawa. This is a spell to secure the help of 道祖神 the Dosojin deities (どうろく神 Dorokujin in local dialect). The young folks hang a Shimenawa over the road to the village and the elders now take a rest from the usual farm work. This custom is also called 盆正月 bon shogatsu. It was often held on the first day of the second or sixth lunar month. It was popular in the Edo period as a means to get one holiday. shiryoo 死霊，ikiryoo 生霊 "dead soul, living soul"
wakasama ワカサマ Waka Sama is the name of a female divner who can tell the cause of a disease or death. At the park 狸森 Mujinamori there was such an old woman of about 70 years. She was blind and wore black robes. She sat in a corner of the Shrine 蟇目鹿島神社 Hikime Kashima Jinja, set up with four bamboo poles and a Shimenawa. Inside the sacred space she put a kamidana 神棚 shelf for the Gods to give the Gods a space to come down to and let her know the answer to the quest. At 船坂の大岩 （おほいし）the great rock of Funasaka people have a special belief. They hang a Shimenawa all round the stone, built a small sanctuary on top of it and pray to 大岩龍大明神 the Dragon Deity of the Boulder. 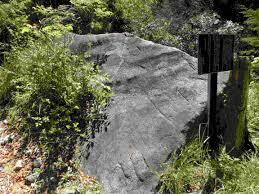 The lord of this rock is seen as daija 大蛇 a large serpent. At the shrine 嶽神社 Dake Jinja there is a sacred 円丘 "round hill" which a Tengu had made in one night. A villager had been up very early and heard the sound of leaves hitting the ground. The Tengu had mistaken this sound for a sign of the coming dawn and thrown the earth in the garden of that person. This earth has become a mound and a pine grew on it. This is now called 天狗松 the Tengu Matsu. During the Autumn festival, they place a Shimenawa around the tree and perform rituals.
. unagibuchi ryuuoo 鰻淵龍王 the Dragon King of the Eel Pool . okuri shoogatsu オクリショウガツ sending off the New Year. They burn the Shimenawa and spread the ashes all around the home and estate. This will keep any 長虫 "long thing" , for example 蛇 a serpent, from coming in. This custom is also known in other parts of Kagawa.
. goshiki no tanzaku 五色の短冊 Tanzaku poetry slips of five colors . Once there was an outbreak of an epidemic in the village. So they put a guard house at the village entry and a large Shimenawa along the coast. Then the fishermen begun to shout"
"エンサエンサ ensa ensa". Very soon there was 魔物 a monster fleeing the village. At Eboshi no taki, エボシ滝 / えぼしの滝 the Eboshidaki waterfall in エボシ谷 the Eboshi valley once there hang a white serpent like a Shimenawa at the top of the waterfall. To keep it alive, people are not allowed to make a fire near the tail part of the serpent. There are many folk believes in the village about serpents. If a rat starts to nibble at the Shimenawa of the kamidana 神棚 shelf of the gods there will soon be a fire. If one sees a serpent climbing up the mountain path (ノボリヘビ nobori hebi ), this will bring good luck. Seeing a yamakagashi ヤマカガシ（Rhabdophis tigrinus）is especially auspicious. The first serpent seen in a year is called ハツヘビ hatsu hebi. If it faces the human, that will bring good luck for the whole year. If it faces the other direction, this will bring bad luck. If one sees aodaisho 青大将 (Elaphe climacophora) in the first dream of the year and if this serpent is swallowing a frog, this means one does not have to worry about food for the coming year. On the 15th day of the New Year (小正月) people take off the Shimenawa and bring it to 氏神 the family shrine. Then it is burned in the front yard. Touching this fire slightly will prevent a person from falling ill in the coming year. There was a home where a Tengu lived. They had put a Shimenawa in the garden around the 松 pine tree. The Tengu sometimes ate their 鮭 salmon or kidnapped their children.
. Tengu to matsu 天狗と松 Legends about the Tengu pine . The messenger of the deity Sanno Gongen 山王権現 is a monkey, and the animal is sometimes seen as a deity itself, protecting people from harm and bringing good health to the children. The monkey is also the messenger of 山の神 Yamanokami. The whole mountain around the temple Jiko-Ji is seen as the territory of Yamanokami, and the monkey is free to roam the fields and forests. The local people call the monkey Saruhachi Buddhist King and protect it. The monkey on the stone relief is clad like the dancing monkey of Sanbaso. The stone dates back to 1786.
. Sanno Gongen 山王権現 and the Monkey .
. Hiyoshi Taisha 日吉大社 Great Hiyoshi Shrine . and the deity Sanno, the "Mountain King"
. sanba sarugaku 三番猿楽, 三番叟 Sanbaso, Sambaso dance . Sanbaso is an auspicious dance, often performed during the New Year season.
. Sarugami 猿神 The Monkey Deity .
. yamainu 山犬 wolf - "mountain dog" .
. inoshishi 猪 wild boar . Sarugami was known in various provinces, for example in 備前 Bizen and 備後 Bingo in Okayama. At the house where a white arrow was stuck, a girl had to be given as human sacrifice for Sarugami. Then a 山伏 Yamabushi mountain priest came and tried to help. At 丑三つ時 a ghostly hour a monster came wandering from behind the Shrine and begun dancing around the carriage with the girl. When he tried to open the box, the Yamabushi let his dog run and kill the monster. In the morning they came and had a good look at it - it was an old monkey. The mother of Minamoto no Yorimasa (源頼政) (1106 – 1180) was severely ill.
An itinerant priest had come from the province of the other side of the waterfall. The villagers were quite happy to have him and gave him a young girl as a wife. This priest even tried to make the girl a human sacrifice for Sarugami, the local Yamanokami. On the evening before the Shrine Festival, villagers had to offer a girl to 大猿 the Great Monkey. A monk came and tried to change the events by making the Great Monkey a living sacrifice. But the Monkey cried terribly in great fear and eventually the monk took pity and let him run in to the mountain. Yamanokami is seen as a monkey or as a woman. Yamanokami of the 道地 Dochi region is called テングサン Tengu san. In the 土佐郡 Tosa district, 杣 forest workers have to observe certain taboos before entering the forest. They must not use 不浄の火 improper fire. They should not use the words hari 針 needle, neko 猫 cat, saru 猿 monkey, or boozu 坊主 priest. They also do not build a group of seven people.
. shichinin misaki 七人ミサキ "Misaki of seven people" .
. 木葉猿 Konoha Saru 木の葉猿 monkey from Konoha village . 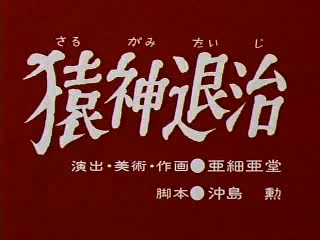 The story of a human sacrifice.
. Shippeitaro 竹箆太郎 / しっぺい太郎 - 早太郎 Hayataro, the spiritual dog . Near the smalles part of the gorge of river Abukuma there are two huge rocks facing each other. 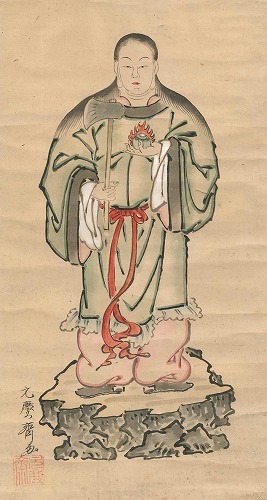 The Deity from 霊山 Mount Ryozen was known as 山王権現 Sanno Gongen and his messenger, the monkey, could jump from one rock to the other, Sarutobi. The warrior 安倍貞任 Abe no Sadato defended this area.
. 安倍貞任 Abe no Sadato (1019 – 1062) . 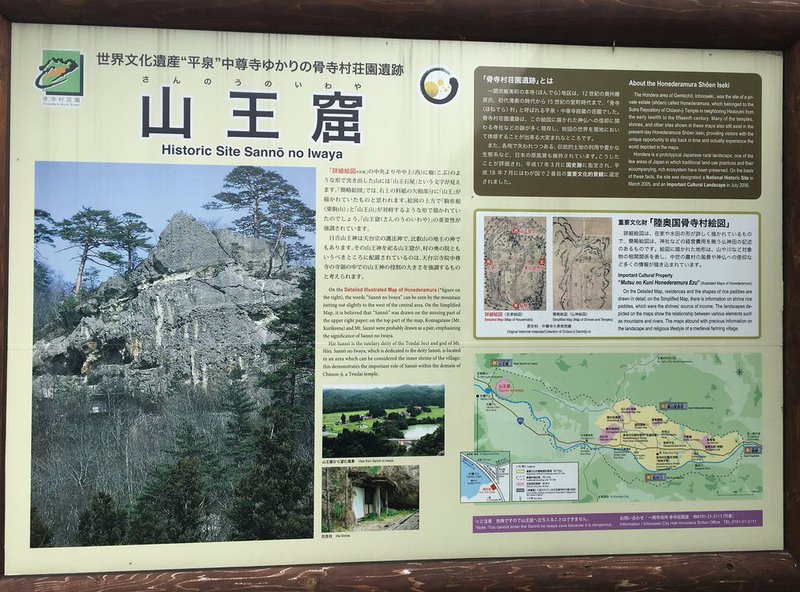 Sanno Iwaya densetsu 山王窟伝説 Sanno rock at 骨寺村 Honedera mura "bone temple village". 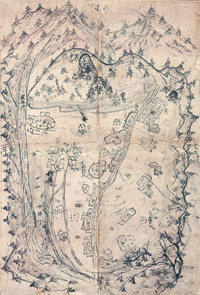 The map is drawn on four pieces of paper joined together, with the top of the map pointing west; the entire village is depicted. The boundaries of the village---Kagikake in the east, Sanno no Iwaya in the west, the Iwai River in the south, and the ridgeline from Mitakeato to Masaka Shindo in the north---are represented with bold lines. Yamanokami does not like the love song サンサシグレ "sansa shigure" , which is song for various rituals. Forest workers are not allowed to hum the melody while working. Hunters are not allowed to use the word MONKEY while they are in the moutains. Wolves, monkeys and wild boars are the messengers of Yamanokami. Yamanokami is quite wild and the Tengu maybe an incarnation. The 9th day of the second and 12th lunar month are set for rituals of Yamanokami. If people go to the mountain forest and see a monkey running around riding on a dog, they are doomed to die. a strange Yokai monster (the Nue) was flying in the sky. A brave samurai shot it down with three arrows. 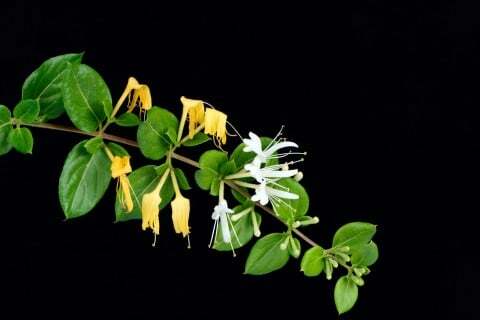 the tail became the plant suikazura スイカズラ / 吸葛 honeysuckle, Lonicera japonica (other versions say 蛇 a serpent). The head flow off to 讃岐国 Sanuki and became Sarugami. the tail flew off to 備前国 Bizen and became the plant Suikazura.
. NUE, nue 鵺, 鵼, 恠鳥, or 奴延鳥 the Nue monster . - - - - - The cursed Nue came floating in the sea to Shikoku. Its head landed in Sanuki and became a monkey deity. Its tail landed in Iyo and became a serpent deity. Its hands and feet landed in Tosa and became a dog deity.
. suikazura スイカズラ / 吸葛 / 忍冬 と伝説 Legends about honeysuckle . The makers of wooden tools and toys, kijiya 木地屋, venerate Yamanokami. If normal people go to their places of worship and make fire, they will find a cruel death. Since Yamanokami is Sarutahiko, they are not allowed to use the word SARU (monkey) while they do their work. Once Yamanokami and 水の神 Mizunokami, the God of the Water, had a contest about which had more, trees in the forest or fish in the water. They called out each name and counted it. In the end Yamanokami seemed to have lost because he called two names, 猿すべり Sarusuberi and さるたの木 Saruta no ki, for the same tree. They tore the records and tried to forget about it. 山の神の木数えの日 the day of Yamanokami counting trees. If a person goes to the mountain forest on this day, he will be counted as a tree.
. sarusuberi 百日紅 Crape myrtle . Even monkeys fall from trees! sarusuberi!
. Mizu no Kamisama 水の神様 God of Water .
. The number of their kenzoku 眷属 followers and servants .
. Ta no Kami 田の神 - Table of Contents . The tsuchinoe day nearest to the vernal and autumnal equinoxes; the "irregular holiday" (holidays celebrated on days when the sun is not situated at one of the 24 equal divisions of its annual orbit) celebrated on those two days. Individually the two are called shunsha (the "vernal shanichi") and shūsha (the "autumnal shanichi"), but if one simply says shanichi then it usually refers to shunsha. On these days, people take a break from farming, and a custom of meeting in shanichikō (shanichi community associations) and chijinkō (earth kami community associations) also exists. Also, the spring shanichi is considered to be the standard day for the soaking and softening of seeds. In China, shanichi was the festival day for celebrating the sha (Ch: she), which refers to the "land kami," the "tribal kami," or the celebrations devoted to them. The date of shanichi celebrations in China varied by region and time period, but their functions generally have not: the spring shanichi was to pray for agricultural production and the autumn shanichi was to express gratitude for the harvest and to divine the coming harvest year. Japan's shanichi celebrations also came from these traditions, but as it spread from region to region, the content of the events took on great variation. For example, people living in Tokushima Prefecture have a custom in which they call on Ojishisama and celebrate that kami in parish festivals in which the tōya (secular households overseeing the ritual in their area) pounds mochi. 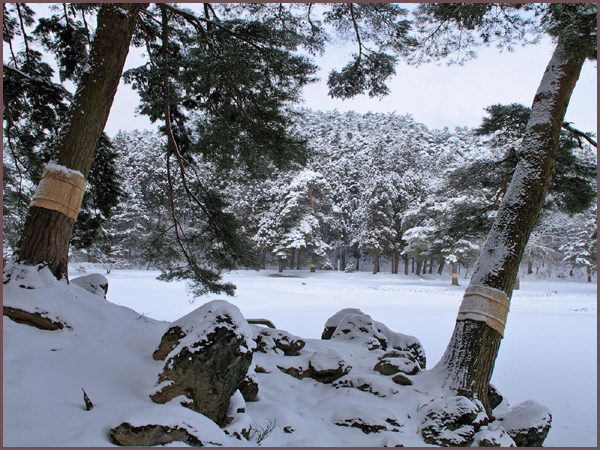 On shanichi, the people of Nagano Prefecture honor the ta no kami, or "kami of the fields," in their celebrations. They believe that in the spring, the ta no kami descends from the mountains to watch over the rice cultivation and returns again to the mountains in the fall, and worship him by pounding mochi in both spring and autumn. In Oita Prefecture's Hida basin, people call this holiday "sajitsu," or "saji" and believe that on the saji in February, the kami Sakugamisama descends from heaven and in the autumn saji he ascends to heaven. In part of Fukuoka Prefecture's Kaho District, people call it oshioi, and have a custom of purifying the house within and without using ocean sand brought home from the beach. Bishamon Sama is a greedy deity. If one borrows money it has to be given back in double. He is also seen as Sakugami. On the 13th day of the first month, farmers place 20 soy beans into the hearth. If they all become black, it will be a good harvest this year. If only half will get black, only half of the good harvest. On the 15th day of the 6th month, cucumbers are offered in the hope they will induce 豊作 a good harvest.
. Bishamon-Ten 毘沙門天 Vaishravana . Daikoku Sama 大黒様 is seen as 作神様 Sakugami Sama.
. Daikoku Ten 大黒天 Daikoku Sama . Sakugami Sama is called セン神様 / センガミサマ Sengami Sama. On the Day of the Shrine in Spring (shunsha 春社) (usually in the third month) in the early morning before the birds begin to sing, Tanokami is coming down. Since he likes fish, people make offerings of fish salad, fish soup and rice with soy beans. Farmers get up early and put 鍬 / 鋤 the hoes and plows outside the barn for blessings. This is an equivalent for the ritual tauchi 田打ち the first "hitting of the fields". From the Shrine Day in spring until the Shrine Day in autumn (usually in the ninth month) the deity seen as 作柄 the supervisor of the harvest. If the deity comes late in spring and leaves soon in autumn, it will be a good harvest, because this deity likes to eat a lot, and if he stays too long, the harvest will suffer. Rituals for this deity are held on the nearest 戊の日 Day of the Wild Boar close to the spring and autumn equinox.
. shanichi, shajitsu 社日 "day of the shrine" . This day varies according to the Asian Lunar Calendar. The god of the earth had a special festival twice a year around the spring and autumn equinox to welcome him and send him off. The day was defined to be the "light or elder day of the earth" tsuchi no e　戊, according to the Asian lunar calendar and the knowledge of the five elements. This day is also called "Shrine Day" shanichi 社日. On this shrine day, farmers would assemble at the local shrine and dance for the gods, praying for a good harvest in spring (shunsha 春社）and thanking for a good harvest in autumn（shuusha 秋社 Shusha）. In autumn, the god of the earth was then sent off to the mountain, to live there until next spring as the "god of the mountain, yama no kami 山の神. 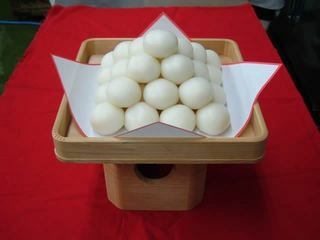 On the evening of the 15th day of the second month in Spring 16 rice balls are made as an offering, 二月の十六団子 nigatsu no juuroku dango. On the next morning, they are eaten by the family. Before eating them, the empty 臼 mortar is hit with the mallet to make a sound, in order to make the Sakugami come down from heaven. In Autumn on the 15th day of the 10th month another set of 16 rice balls is prepared, this time the 十月の十六団子 juugatsu no juuroku dango. This time the mortar is not hit with the mallet, but the mallet is simply laid over the mortar. This is put on a high place in the kitchen, to show the Sakugami the way back to heaven.
. dango 団子 and ritual offerings . 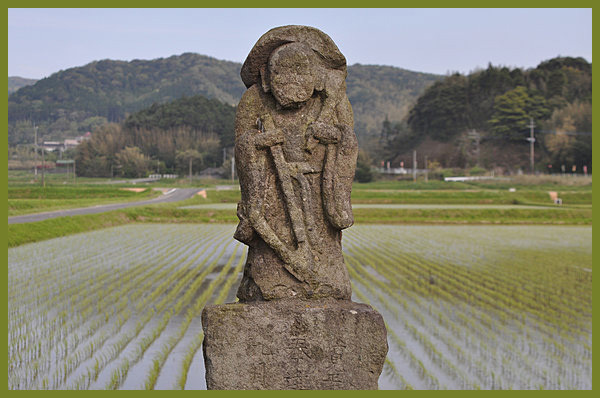 In the hamlet of 南畑部落 Nanbata Shanichi Sama is venerated as 田の守り神 the protector deity of the fields. Each farm house venerates 稲荷様 the rice Deity Inari sama as the Sakugami Sama on the day hatsu-uma 初午, the first day of the horse .
. hatsu-uma 初午 First Day of the Horse .
. Ta no Kami 田の神 - Table of Contents - . - - - Tanokami Deity . . .
- - - - - CONTENTS - - - listed on the right side !